Dead Sea Ever wondered what is a Dead Sea? Have you ever wondered why the ocean is salty? Here's a look at what makes the ocean salty and details of Dead Sea. Dead Sea is a salt lake or inland sea located in the Jordan Valley. The surface of the Dead Sea is over 1,300 feet below the sea level. 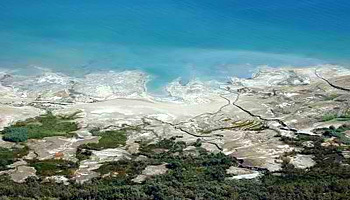 It has got the most saline water on Earth with salinity ranging from 28% to 35%. Normal sea water shows the salinity of 3 to 6%. Hence the Dead Sea is almost 6 times saltier than the normal sea water. The Dead Sea gets saltier as we go deep inside it. 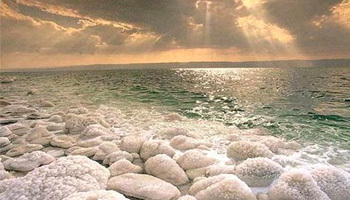 Below 300 feet inside the Dead Sea, the dissolved salt concentration approximates to 332 grams per kilogram of seawater and it is said to be the saturated amount of salt in water. When substances dissolve in a liquid, the density of the liquid increases. The dissolving molecules mix with the liquid molecules, so each drop of liquid now has more molecules in it. Sea water has salt and other substances dissolved in it that makes it more dense than fresh water. Dead Sea water has a clear, blue–green color and a bitter, nauseous taste and is slightly oily to the touch. Formation of Dead Sea It was formed 3 million years ago and miraculously retains the purity of its ancient waters, even today. How the Dead Sea was formed? The Dead Sea was first visible about 3 million years ago and its inception has been the subject of many writings, both ancient and present. It all began when the area was repeatedly flooded with waters from the nearby Red Sea. As the years passed, the resulting collection of water formed a shore that reached through the Jezreel Valley. The floods and climate changes contributed to many geologic changes. Approximately after 1 million years, the land rose in such a way that the ocean could no longer flood the area, and the existing water stayed – this area became an inland sea known as the Dead Sea. 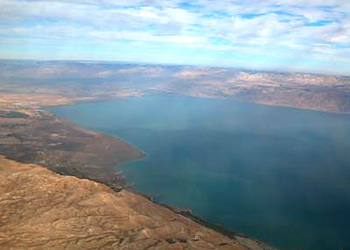 The East Rift Valley is responsible for the continued sinking of the Dead Sea. 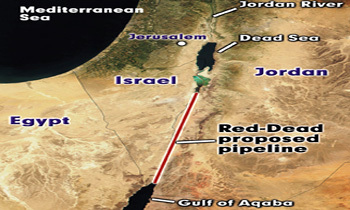 It runs through a large portion of Africa, and begins just north of the Dead Sea. Along this valley, the earth&apos;s crust is thinning and spreading. As the plates spread further apart, the Dead Sea "sinks" – as much as 13 inches per year. This rate of sinking is quite impressive in geologic terms, and contributes to be a mystery that surrounds the Dead Sea. The Dead Sea's mineral composition differs from that of ocean water, varying with season, rainfall, depth, and temperature. What is the composition of Dead Sea? The mineral content of the Dead Sea is very different from that of ocean water. The exact composition of the Dead Sea water varies mainly with season, depth and temperature. In the early 1980s, the concentration of ionic species (in g/kg) of Dead Sea surface water was Cl− (181.4), Br− (4.2), SO42− (0.4), HCO3− (0.2), Ca2+ (14.1), Na+ (32.5), K+ (6.2) and Mg2+ (35.2). The total salinity was 276 g/kg. These results show that the composition of the salt, as anhydrous chlorides on a weight percentage basis, was calcium chloride (CaCl2) 14.4%, potassium chloride (KCl) 4.4%, magnesium chloride (MgCl2) 50.8% and sodium chloride (common salt, NaCl) 30.4%. In comparison, the salt in the water of most oceans and seas is approximately 97% sodium chloride. The concentration of sulfate ions (SO42−) is very low, and the concentration of bromide ions (Br−) is the highest of all waters on Earth. No fish exists in Dead Sea Fish can't live in the dead sea because of the salinity of the water making it impossible for fish. The fact that the water doesn&apos;t escape the Sea just traps the salts within its shores. What type of marine life exists? There are no fish or any kind of squirming creatures that exist in Dead Sea due to the high salinity of water. 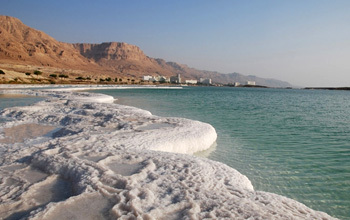 Several types of bacteria and algae have adapted to such harsh life of Dead Sea. The water in the Dead Sea is deadly to most living things. Fish accidentally swimming into the waters from one of the several freshwater streams that feed the Sea are killed instantly, their bodies quickly coated with a preserving layer of salt crystals and then tossed onto shore by the wind and waves. What makes the Dead Sea so salty? The Dead Sea is continually fed water from the rivers and streams coming down off the mountains that surround it. The water gets out of the Sea through evaporation. This part of the world has most part of the Sun making it the hottest region. As the water evaporates, it leaves behind all the dissolved minerals in the Sea, just making it saltier. In fact, it&apos;s through the dual action: continuing evaporation and mineral salts carried into the Dead Sea from the local rivers. 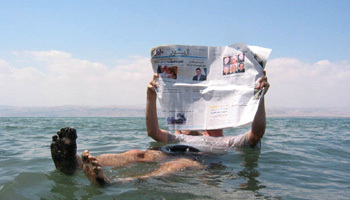 Floating in Dead Sea Dead Sea water is very dense compared with fresh water or ordinary sea water. The Dead Sea&apos;s unusually high salt concentration means that people can easily float in the Dead Sea due to natural buoyancy. In this respect the Dead Sea is similar to the Great Salt Lake in Utah in the United States. The key to this strange phenomenon is the high level of mineral salt within the Dead Sea. In fact, sitting at roughly 31.5 per cent, the Dead Sea has a salinity roughly ten-times that of a standard ocean. The consequences of this are two fold: firstly, no water-dwelling creature or plant can survive in the Dead Sea, and secondly, humans can float due to its high density compared to our average mass. Simply put, the Dead Sea’s high salt content has the effect of making the human body more buoyant. Dead Sea border The high salinity of the water provides swimmers with natural buoyancy without any efforts. The Dead Sea found on the borders of Israel and Jordan is the world&apos;s saltiest and densest body of water. First, it&apos;s completely landlocked, so any fresh or saltwater that flows into it from the Jordan River and other tributaries (estimated at six and a half million tons per day) is trapped – until it evaporates. Evaporation happens quickly because that portion of the world is extremely hot, leaving the salt behind. The concentration of salt in the water is so high that the only living things that can make their home there are bacteria. When the water evaporates, the salty minerals are left behind, causing the remaining water to become	more and more concentrated with salt. Since human bodies have a lower density than the water of the Dead Sea, people can float in it effortlessly. The extremely salty water holds people up instead of letting them sink. The Dead Sea region has been known for its medicinal and therapeutic properties for thousands of years. Its pure, mineral-rich waters and warm, temperate climate has made the area a center of wellness and treatment centers, and has long attracted visitors from around the world. The Dead Sea owes its high mineral salt content to several factors. Potash and bromine are the chief minerals extracted from the water for commercial use. More than 35 different types of minerals (like those found in oceans) can be found in the Dead Sea&apos;s waters. Some of the minerals present include potassium, bromine, calcium, magnesium and iodine. These are the salts that give the Dead Sea its name. These mineral salts are believed to cure or alleviate the symptoms of ailments ranging from skin problems such as psoriasis and atopic dermatitis to rheumatic diseases, like various forms of arthritis and fibromyalgia. Patients dealing with respiratory diseases such as asthma, chronic obstructive lung disease and cystic fibrosis often benefit from the area&apos;s high oxygen levels, coupled with the environment&apos;s low pollution and allergen levels. 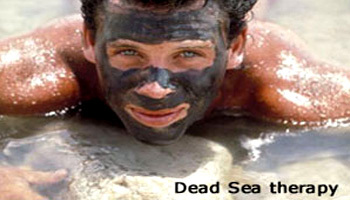 Dead Sea therapy is also used to treat Crohn&apos;s disease, orthopedic ailments, heart disease and hypertension. The water, minerals, mud and sunlight have naturally nourishing effects on skin. Black mud found along the shoreline is also rich in minerals and is often used in skin treatments. Evaporated Dead Sea The water levels in the Dead Sea - the deepest point on Earth - are dropping at an alarming rate with serious environmental consequences. The Dead Sea is recognized as a powerful rehabilitative center, thanks to the wonderful climate it possess, therapeutic waters and natural beauty. The shores of the lake are now teeming with spas, wellness centers, hotels and retreats. The area is completely flooded with tourists from all over the globe. In recent decades, the Dead Sea has been rapidly shrinking because of diversion of incoming water from the Jordan River to the north. This is due to human intervention in the form of pipelines, dams and storage reservoirs diverting the water to other areas. 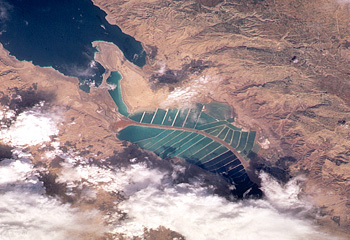 The southern end is fed by a canal maintained by the Dead Sea Works, a company that converts the sea&apos;s raw materials.